2016 has been full of effective organizing in communities across Ontario. The many groups that make up $15 and Fairness have only gotten stronger in the fight for decent work. Health providers, migrant workers, students, unions and more continue to speak up for a $15 minimum wage, paid sick days, and improved, updated labour laws. The faith community also joined our fight against precarious work this year by releasing a statement calling for a $15 minimum wage and fair working conditions. The faith community has proven to be an important part of our decent work movement. 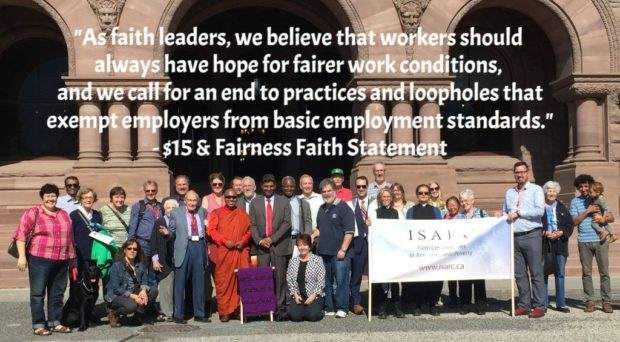 In October 2016, ISARC held an interfaith prayer vigil for decent work at Queen’s Park. 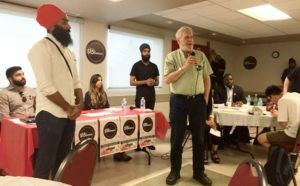 They called on faith leaders to sign the statement in support of a $15 minimum wage and fair labour laws. Since then, faith leaders have been busy spreading awareness and doing outreach. In time for High Holidays, Rabbis published an opinion piece in the Toronto Star calling for $15 and Fairness. The piece outlined the need for emergency leave, paid sick days and fair scheduling. 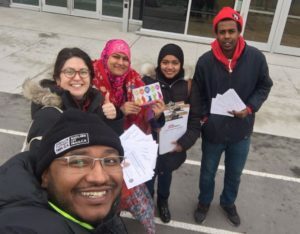 Just last week, the Muslim Workers Network went door-knocking in Regent Park, and collected signatures on $15 and Fairness postcards addressed to the local MPP, Glen Murray. Their next canvasses are set for Sunday January 22nd in Thorncliffe Park, and Saturday February 18th in Rexdale. Make sure to join their Facebook group to get involved. All of this outreach is paying off. There are now 110 signatures on the Faith Statement, and we are confident we will have hundreds more with your help. In spring 2017, $15 and Fairness plans to publicly present the Faith Statement and its signatories. To make it a truly inspiring and impactful event, we need your help securing as many signatures as possible. Help $15 and Fairness grow and prosper in the New Year by activating your own faith community today. Please share the statement with your faith networks now and as you celebrate the beginning of 2017. Faith leaders can add their names online or sign a two-page printable version that can be scanned and emailed to info@15andfairness.org, or mailed to $15 and Fairness at 720 Spadina Avenue, Suite 206, Toronto, Ontario M5S 2T9.